Rahul said noteban was linked to the Uttar Pradesh assembly polls this year and the PM took the step without thinking. NEW DELHI: Rahul Gandhi slammed PM Modi for his demonetisation decision saying the controversial policy hurt the farmers and hit tourism in Himchal Pradesh. “Modiji hurt the apple growers, farmers and people working in the tourism sector in Himachal Pradesh,” Rahul said while addressing a rally at Paonta Sahib. He later addressed two more rallies at Chamba and Nagrota. The noteban he said was linked to the Uttar Pradesh assembly polls this year and the PM took the step without thinking. Rahul also slammed the government’s another eco reform move GST saying it had hit the traders and took away jobs. “When we come to power in 2019, we will change the GST,” he said, adding that traders in Modi’s home state Gujarat were angry over GST. 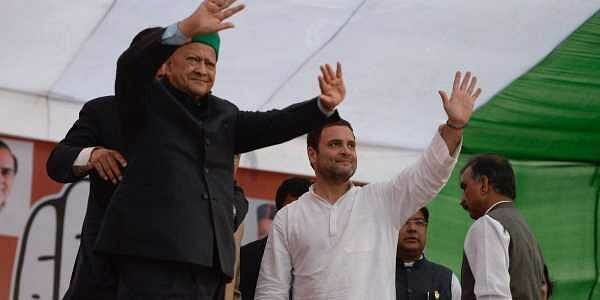 Rahul, who was initially against naming chief minister Virbhadra Singh as the party’s nominee for the top job but did so when the veteran threatened to leave the party, praised the octogenarian for bringing development to the hill state. “We work hard day and night unlike the Modi government which only makes promises,” he said. Citing Niti Ayog data, Rahul said that Himachal performed better than Gujarat, which Modi used to showcase when he was chief minister of the western state. Invoking the Bhagwat Gita after praying at the historic Paonta Sahib gurdwara, the Congress vice president said while the Hindu text said one should focus on action and not fruits thereof, the PM believed that one should savour the fruits and forget about action. Later in the day, the Congress leader slammed the PM for job losses due to noteban and GST saying he wanted to see Chinese youth take selfies with mobile phones made in India to reverse the current trend of Chinese manufacturers cornering a lareg share of the market. “I am ashamed that China is able to create jobs but not India,” he said. Taking on the PM on the issue of corruption after Modi’s recent attack on the Congress, Rahul reiterated the cases related to cash for jobs scam Vyapam in Madhya Pradesh and the recent extraordinary profits of Jay Shah, son of BJP chief Amit Shah. “The PM has not said even word on these charges,” he said.